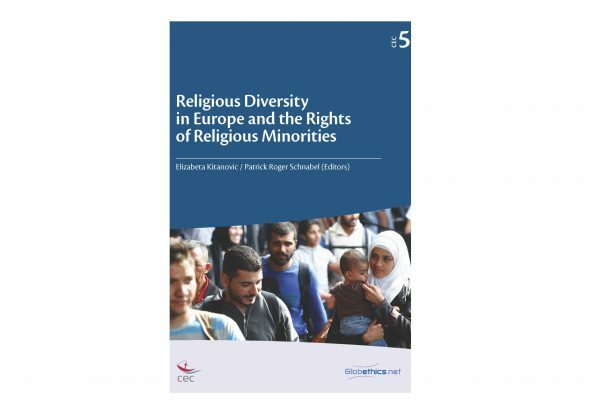 CEC’s new publication Religious Diversity in Europe and the Rights of Religious Minorities, edited by Dr Elizabeta Kitanovic and Rev. Dr Patrick Roger Schnabel is now out! The publication, produced in partnership with Globethics.net contains contributions from experts brought together by CEC in Zagreb, Croatia to discuss the challenges facing minority churches, and religious minorities in general. The European landscape presents many difficulties for these communities. Some struggle with obtaining legal status, some are subject to discrimination, exclusion or even open hostility. Widespread prejudices, destruction or confiscation of property, and barriers to religious rituals and ceremonies make daily life difficult for many communities across the continent. CEC, and the participants gathered at the Zagreb conference, are convinced that minorities bring value to societies, and that deeper religious literacy, enhanced understanding, and fostering dialogue will contribute to their flourishing. Digital copies of Religious Diversity in Europe and the Rights of Religious Minorities may be downloaded from the CEC website and print copies may be ordered through our publishing partner, Globethics.net.